According to the 2014 Zoonosis Monitoring Report (1), the majority of verified outbreaks in the EU were associated with foodstuffs of animal origin. Fruit and vegetables were implicated in only 7,1 % of the verified outbreaks, primarily caused by frozen raspberries contaminated with Norovirus, albeit showing an increase compared to 2013 where ‘vegetables and juices’ were reported in 4,4 % of the outbreaks. Nevertheless, the possible consequences of microbiological contamination of fresh fruits and vegetables (FFV) cannot be underestimated as shown by the German crisis (2) linked to the contamination of sprouts by Verotoxin-producing Escherichia coli (VTEC). Salmonella and Norovirus in food of leafy greens eaten raw as salads. Salmonella and Norovirus in berries. Salmonella and Norovirus in tomatoes. Salmonella, Yersinia, Shigella and Norovirus in bulb and stem vegetables, and carrots. This guideline takes account of the relevant opinions of EFSA, and consultation with Member States experts and relevant stakeholders. Though it is intended to offer practical help to growers, it may also be used by official inspectors during their audits where appropriate. EFSA confirmed that further research on possible risks and risk mitigating measures related to FFV should continue. The purpose of this guidance document is to assist growers (regardless of size) at primary production to apply in a correct and uniform way hygiene requirements related to production and handling of FFV. It will provide guidance to growers on how to address microbiological food safety hazards through good agricultural practices (GAP) and good hygiene practices (GHP) in primary production (i.e. growing, harvest and post-harvest) of FFV sold to consumers raw (unprocessed) or minimally processed (i.e. washed, sorted, packed), including during transportation provided that these activities do not substantially alter their nature as laid down in the definition of Annex I of Regulation (EC) No 852/2004 (4). These activities are hereafter referred to as ‘associated operations’. These good practices should be implemented throughout the primary production chain. Implementation of this guidance should be considered a priority for any FFV eaten raw and, wherever possible, be aimed at for FFV eaten cooked. 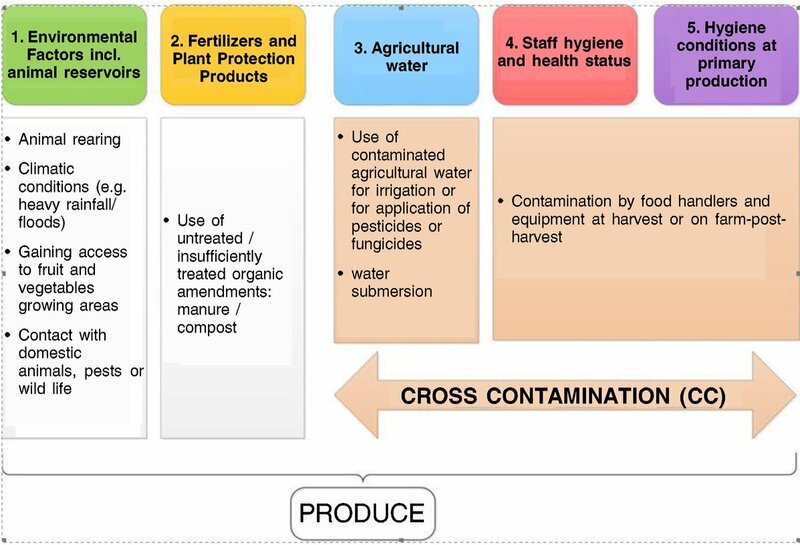 This Guidance covers the good hygiene practices (GHP) and good agricultural practices (GAP) involved in the production of fresh fruit and vegetables at the primary production level, including associated operations, with the purpose to control microbiological pathogens causing gastrointestinal illness due to the consumption of FFV (5) (e.g. pathogenic E.coli, Hepatitis A virus, Listeria…). Additional specific guidance for certain produce is included where appropriate (6). As specific EU guidance for good hygiene practice in the production of sprouts and seeds for sprouting (7) is being prepared by the European Sprouted Seeds Association, the production of this category is not further addressed in this guidance. This guidance document gives guidance as to how to apply the general hygiene requirements in the case of FFV. It should be used in conjunction with other applicable guidance documents. The European FFV industry being very diverse, though the categories of FFV considered hereafter are produced under diverse environmental conditions within the EU Member States and thus some provisions of this guidance might be adjusted to suit small farms, or traditional farming areas, the general hygiene requirements laid down in Annex I of Regulation (EC) No 852/2004 must always be fulfilled. This guidance is specifically dedicated on how to address microbiological hazards. All growers must comply with the relevant EU regulations associated to the practices described in this guide. For a complete understanding, it is essential to recall the most relevant EU legislation for good practices at the primary production of fresh fruit and vegetables. Regulation (EC) No 178/2002 (8) of 28 January 2002 of the European Parliament and of the Council lays down the general principles and requirements of food law, establishing the European Food Safety Authority and laying down procedures in matters of food safety (generally called ‘the General Food Law’). Regulation (EC) No 852/2004 (9) of the European Parliament and of the Council of 29 April 2004 on the hygiene of foodstuffs lays down general hygiene requirements to be respected by food businesses at all stages of the food chain. All food business operators (all growers are Food Business Operators) have to comply with this Regulation’s requirements for good hygiene practices, aimed at preventing the contamination of food whatever its origin. The scope of this Regulation has been illustrated in the Appendix. Commission Regulation (EC) No 2073/2005 (10) of 15 November 2005 lays down microbiological criteria for foodstuffs. Regulation (EC) No 396/2005 (11) of 23 February 2005 of the European Parliament and of the Council lays down maximum residue levels of pesticides in or on food and feed of plant and animal. Council Directive 86/278/EEC (12) of 12 June 1986 lays down the use of sewage sludge in agriculture in line with the protection of the environment, and in particular of the soil, as amended by Directive 91/692/EEC, Regulation (EC) No 807/2003 and (EC) No 219/2009. Council Directive 98/83/EC (13) of 3 November 1998 lays down criteria related to the quality of water intended for human consumption. Council Directive 91/676/EEC (14) of 12 December 1991 lays down provisions aiming the protection of waters against pollution caused by nitrates from agricultural sources and preventing further such pollution. Regulation (EC) No 1069/2009 (15) of 21 October 2009 lays down health rules as regards animal by-products and derived products not intended for human consumption and repealing Regulation (EC) No 1774/2002 (Animal by-products Regulation). Commission Regulation (EU) No 142/2011 (16) of 25 February 2011 implementing Regulation (EC) No 1069/2009 of the European Parliament and of the Council lays down health rules as regards animal by-products and derived products not intended for human consumption. In addition, there are national legislations/standards in place in some Member States (17) regarding the quality of reclaimed water. Complementary EU hygiene guides are available at DG Sante website/food safety issues. At international level, further information is also available in the Codex Alimentarius codes of hygienic practices relevant for FFV (18). The example check lists (No 1 to 7) below illustrate the hygiene obligations per risk category (as identified by the EFSA opinions), which any grower can use to check if he fulfils EU hygiene requirements. In addition, these checklists can help growers put in place appropriate recommendations provided in Chapters 6 and 7 of this guide. When was the last official control (indicate date)? Reg. 852/2004, Annex I, Part A, II.6. In case of non-compliances, has the appropriate remedial action (arising from last official controls) been taken? Environmental factors including animal reservoirs are a potential source of contamination of FFV and these risks should be prevented or at least mitigated. In case the analysis signalled a contamination of land, check list No 2 can help growers identify the source of contamination and take the relevant actions to fulfil EU requirements and appropriate recommendations. Have sources of contamination of land used for growing FFVs been identified? Indicate here the source of contamination, if identified and skip the bullet points. If NOT, the replies to the following bullet points should help you to identify the source. Is there access by animals (domestic or wild) to growing land? Is there access of animals (domestic or wild) to water sources used in primary production and associated operations? Is there leaking, leaching or overflowing manure storage areas close to cropping areas? Are there any hazardous waste sites close to cropping areas (currently and in the past)? Are there any sewage treatment sites close to cropping areas (currently and in the past)? Are there any industrial or mining sites close to cropping areas (currently and in the past)? Is there any possibility of runoff from nearby fields? Is there a possibility of flooding of growing land with contaminated water? Is there any surface water surrounding the growing land? Are there any other sources of contamination? Will Primary products undergo any processing that eliminate or reduce contamination to acceptable level? Reg. 852/2004, Annex I, Part A, II.2, II.3. If no, processing is to be undertaken to eliminate or reduce the contamination to an acceptable level, it is of utmost importance to follow GHP described in Chapter 6 of this guide. If a source of contamination has been identified, there is a need to evaluate whether or not the FFV should be grown in this area and if preventive/corrective control measures have been implemented (see examples of measures proposed in Chapter 6 of this Guidance document). Are there measures to avoid contamination from organic fertilisers in place? If composted organic fertilizers from companies are used, is a certificate describing the ‘compost process’ available? When composting is used, is it done in accordance with the guidelines provided in this document (at least 90 days)? Is the appropriate time period (pre-harvest interval) between application of untreated manure and harvest of FFV respected? NB: it depends on the type of FFV and if it is intended to be eaten raw — see table 1 (e.g. minimum 60 days for fresh leafy greens eaten raw). Are there measures in place to minimize contamination by manure and other natural fertilisers from adjoining fields (e.g. care during application and run-off controls)? If so, please answer the following question. Specify the measures used to secure areas where manure and other natural fertilisers are treated and stored and to prevent cross-contamination from runoff or leaching (for example barriers may be used to contain the manure and prevent its dispersal). Where possible, is the equipment, which comes into contact with the manure, washed and disinfected before being used again? Have distribution systems and storage of water used in your agricultural practices been identified? Are sources, distribution systems and storage of water protected against contamination (domestic and wild animals, bird droppings…)? Are water sources and distribution systems used during production isolated from manure and potential runoff? Are sources, distribution systems and storage of water protected against inflow of run-off in case of heavy rainfall? Are sources, distribution systems and storage of water used in your agricultural practices regularly controlled? (e.g. visual inspection, microbial assessment). What type of irrigation method is used (e.g. flood irrigation, overhead irrigation and drip irrigation)? What is the time-interval between the last irrigation and harvest? Does irrigation water have contact with the edible part of FFV? Do FFV have physical characteristics that facilitate accumulation of water (e.g. leafy green salads with rough surfaces where water may accumulate)? If yes, which action(s) have you taken? Do FFV undergo any post-harvest washing treatment prior to packaging? If FFV undergo post-harvest washing treatment prior to packing, remember that potable water has to be used for the final wash of ready-to-eat FFVs, whereas clean water may be used for initial washing stages. Does the production system allow direct contact between the soil and the edible parts of the crop? Has a risk assessment been carried out to identify the risk factors of water sources? If yes, is it for crop production or/and post-harvest handling? It is important to consider, based on the type of risk, if microbiological testing of the water used in your agricultural practices is necessary (for more explanations see Chapter 6.3 of this Guidance document and Annexes II and III). Is it for pathogens and/or indicator microorganisms? Are the data obtained used to elaborate a historical background to determine the most risks sampling points/sampling time? Are the water testing results satisfactory? If the above mentioned results are not satisfactory, have corrective measures been taken? Are there specific control measures for each of the identified risk factors put in place? Are signs to instruct employees to wash their hands posted visibly in appropriate areas? When protective equipment is used, is it in appropriate condition and clean? Is there a policy for handling employee’s illness in place? If yes, please answer the following bullet points. Are personnel aware of not working in contact with produce if they feel unwell, particularly if they have symptoms such as diarrhoea or vomiting? Do personnel report any kind of illness or injury to the management? Are cuts and wounds covered and protected when personnel are permitted to continue working? Are areas away from the field and packing lines provided for workers to take breaks and to eat? Are non-essential persons, casual visitors etc. prevented from accessing the cropping area and other food production areas? Is the farm maintained under sanitary conditions and in good repair? Reg. 852/2004, Annex I, Part A, II.5 (a), (b). Are toilets and sanitary facilities provided based on the recommendations (22) (workers/number of toilets) and are these segregated from food cropping and production areas? Are toilets and sanitary facilities suitably located to prevent runoff? Are toilets and sanitary facilities provided with clean water, soap and means of drying hands? Are sanitizing gels provided at hand-washing facilities and other appropriate locations? Is there adequate drainage at the premises to ensure that food contact materials and equipment are not at risk from contamination caused by standing water? Is waste stored away from the product storage areas to prevent pests? Does non-potable water have a separate system? Is non potable water clearly identified? Is harvest equipment clean and all equipment and tools that come into direct contact with FFV cleaned and, if appropriate, sanitized regularly as required? Are field boxes and product containers only used to hold the product and are they regularly cleaned? Are product containers suitable for contact with food? Are containers and equipment kept in good conditions to avoid contamination and damage of product? Are harvested products protected from wind, rain and sun and moved to a processing or packing facility as soon as possible? Are harvested FFV stored away from chemicals, animals and other sources of contamination? Are FFV unfit for human consumption segregated before storage or transport? Are packaging facilities and equipment kept in a suitably clean condition? Are control temperature options in place? Are transport equipment/containers and vehicles kept clean? Are harvested FFV protected against contamination during transport? Are loading and transportation carried out in a manner to minimise damage and contamination to FFV that may occur? Are cleaning and disinfection carried out in a manner and location that will not cause FFV to become contaminated? Are the results of swabbing satisfactory? Are cleaning chemicals handled and used in accordance with manufacturers’ instructions? Do you have an accurate record keeping system in place? If yes, please answer the following bullet point question(s). Are there records of the occurrence of pests or diseases that may affect the safety of products of plant origin (Required by legislation)? Are results kept of any relevant analyses carried out on samples taken from plants or other samples that have importance to human health (e. g. water quality testing, microbiological analyses of products….) (Required by legislation)? Are there records for the use of applied fertilisers, including identification of the origin of the fertiliser? Are there records for cleaning and disinfection of facilities and equipment? Are there records for staff training in relation to the production of safe food? Are there records and a policy for staff returning to work after illness? Are there records of temperature control checks and calibration of monitoring equipment? Are there records on control of the production activities (seed origin, FFV production control data, etc.)? Are appropriate traceability records in place, which enable to trace FFV one step back & one step forward? Are withdrawal and recall procedures in place? Are records available for inspection by the competent authority and receiving food business operators on request? FFV are grown and harvested under a wide range of climatic conditions and diverse geographical settings. They can be grown in cropping sites indoors (e.g. greenhouses) and outdoors, harvested, and either field-packed or transported to a packing establishment. Production practices, growth conditions and the location of the edible part during growth (soil, soil surface, aerial part) in combination with intrinsic, extrinsic, harvesting and processing factors will affect the final microbiological status of FFV at the time of consumption. It has been shown that microbiological food safety hazards and sources of contamination vary considerably from one type of FFV production to another and from one particular setting/context to another, even for the same FFV. These different factors can be addressed within good agricultural practices and good hygiene practices. Examples and recommendations on how to implement all the obligations corresponding to Annex I (primary production) of Regulation (EC) No 852/2004 can be found later in this document. Assessment of environmental risk factors in and around the FFV cropping area (e.g. to identify potential sources of microbiological contamination) is particularly important because subsequent steps may not be adequate to remove contamination that occurs during production and in some cases may lead to conditions that enable the growth of microbiological pathogens. (Annex I — Part A — II.2) ‘As far as possible, food business operators (FBO) are to ensure that primary products are protected against contamination, having regard to any processing that primary produce will subsequently undergo’. If a grower suspects a possible risk from the previous use of the primary production area, adjoining sites or industrial activity in the neighbourhood, he should consult technical specialists and the sites may have to be analysed for hazards of concern. Growers should ensure that cropping areas are properly maintained by removing litter and waste, and by cutting weeds, plant refuse or grass within the immediate vicinity of any building or protective structures that may constitute an attractant, breeding place, or harbourage for pests (25). Growers should ensure the land surrounding certain protective structures (high tunnel, hoop house, etc.) is cleared from potential sources of contamination for example, plant debris and cull piles should be removed promptly from inside the cropping areas. Physical barriers such as mounds, vegetative buffers, and ditches to re-direct or reduce runoff from animal production or waste management operations are recommended as preventive measures to avoid contamination of the cropping area. Use of distress machines and other repellent equipment, such as those emitting noise or calls (e.g. predator calls, sonic fences and ultrasonic rodent repellents) can reduce animal activity. Growers can use scarecrows, mechanical traps, reflective strips or gunshots to ward off birds and pests from contaminating FFVs. If possible, power lines should not run above fields where plants for raw consumption are being cultivated, to avoid contamination from birds perching on the lines. FFV for which the edible (26) part has come into contact with flood waters close to harvest (less than two weeks) should not be consumed as raw product. If the flooding event takes place more than two weeks before harvest or if these products are processed, a case-by-case (site-specific) risk assessment should be performed. The nature of agricultural inputs is very diverse and can include organic fertilisers (e.g. livestock manure, slurries, and sewage sludge) or inorganic fertilisers (chemical fertilisers). Fertilisers should only be applied in sufficient amounts to meet FFV needs. Since the focus of this guide is on microbiological food safety hazards, inorganic fertilisers are not further considered (27). Organic fertilisers are widely and beneficially applied to meet FFV nutrient requirements and improve soil fertility but their incorrect use can be a source of both microbiological (e.g. Salmonella spp., VTEC, Norovirus) and chemical contamination (e.g. heavy metals). Pathogens may be present in manure and other natural fertilisers and may persist for weeks or even months, particularly if treatment of these materials is inadequate. Physical, chemical or biological treatment methods (e.g. composting (28), pasteurization, heat drying, UV irradiation, alkali digestion, sun drying or combinations of these) may be used to reduce the risk of potential human pathogen survival in manure, sewage sludge and other organic fertilisers. Organic fertilisers should not therefore contain microbial, physical or chemical contaminants at levels that may adversely affect the safety of FFV and their use must comply with the relevant EU regulations and take account of WHO guidelines on the safe use of wastewater and excreta in agriculture, as appropriate. (Council Directive 86/278/EEC) ‘The use of sewage sludge in the production of fruits and vegetables must comply with EU and national requirements. In certain situations, sludge may not be used at all in farming, i.e. on fruit and vegetables (FFVs) during the growing season (with the exception of fruit trees) and on soil used to grow fruit and vegetable FFVs that are usually in direct contact with the soil and eaten raw. This ban applies for 10 months before the harvest and during the harvest itself’. All farm holdings should develop a manure management plan (29) identifying where and when manure can and cannot be applied, e.g. areas where manure should not be applied includes around ditches, watercourses, ponds, springs, wells and boreholes, steep slopes with high risk of run-off, environmentally sensitive areas, fields likely to flood etc. When manure, sewage sludge and other organic fertilisers are applied they should be mixed thoroughly with the soil as soon as possible and in any case before drilling and planting the FFV, as this will reduce the potential for direct contamination of FFV, as well as reduce odour and ammonia emissions and potential losses to water. Avoid locating treatment or storage areas for manure and other organic fertilisers (including storage of sewage sludge) in close proximity to FFV cropping areas. Prevent run-off or leaching from treatment and storage areas contaminating surrounding land, surface and ground waters etc., by using adequate physical barriers (e.g. drainage ditches). Any equipment that has come into contact with manure, sewage sludge or other organic fertilisers should be thoroughly cleaned and, where appropriate, sanitised before being used again. As far as possible, farm vehicle movements should be controlled to prevent cross-contamination of cropping and production areas. Personnel handling manure and sewage sludge should practice good personal hygiene (e.g. washing hands after working with these materials and before handling FFV, eating or drinking etc. ), wear appropriate personal protection equipment and suitable outer clothing, including gloves and waterproof footwear that can be effectively cleaned and disinfected after use. Treated manures can be applied to land used to grow FFV eaten raw at any time before drilling/planting (30). In general treated manures should not be applied to FFV after planting. However, where essential to the production system, treated manures can be applied to the soil to meet FFV nutrient requirements during the growing period providing a valid composting process has been used (see guidance on composting below) and there is no direct or indirect contact with the edible parts of FFV. When using batch stored (or ‘matured’) manure, the storage or passive treatment time will vary depending on the region, climate and origin of the manure. No additions of fresh manure should be made to the store during this storage period. Composting of solid manures is a particularly effective method of controlling microbial pathogens when actively managed. It is recommended that manure be treated as a batch and turned regularly (e.g. at least twice within the first 7 days either with a front-end loader or preferably with a purpose-built compost turner). This should generate high temperatures over a period of time (minimum of 55 °C for 3 days) to be effective in killing pathogens. The composted manure should be allowed to mature as part of the process and, in general, the whole process should last at least 3 months prior to use. Lime treatment of slurry (addition of quick lime or slaked lime to raise the pH to 12 for at least 2 hours) is an effective method of inactivating bacterial pathogens. The slurry should be allowed to mature as part of the batch treatment process. In general slurry should be matured for at least 3 months prior to use. In general the time period between application of untreated or partially-treated manure/other organic fertilisers to land, planting and harvest of FFV eaten raw (pre-harvest interval) should be maximised, as microbial pathogens die off over time. Climate, soil type and origin of manure also affect the survival of pathogens in manure, fertiliser-amended soil and in directly deposited animal faeces (if land has previously been used for grazing). Pre-harvest intervals of 120 days are generally accepted in GAP guidance for fresh leafy greens (31), although a period of 60 days is considered to be the minimum duration. In some cases, pre-harvest intervals of up to 12 months or longer are recommended for FFV eaten raw (e.g. countries with relatively cooler climates and lower levels of solar radiation, such as northern European countries). Table 1 provides an example of some recommended pre-harvest intervals for application of a range of organic fertilisers (including treated and untreated manures) on different types of FFV eaten raw and cooked. Strict controls should be implemented where treated sewage sludge is applied to land growing FFV. Prior to any application, the soil must be tested by the sludge supplier. As far as possible the time period between application of treated sewage sludge and harvest (pre-harvest interval) should be maximised and reflect the type of treatment applied (i.e. level of pathogen reduction in treated sewage sludge) and the FFV grown. In general a longer pre-harvest interval is recommended when treatment results in a lower level of pathogen reduction; the FFV grown is normally eaten raw; and when there may be direct contact between the edible part of the FFV and the soil. Where conventional (32) treated sewage sludge is used, the pre-harvest interval should be at least 30 months for FFV eaten raw or at least 12 months for FFV eaten cooked. Where enhanced (33) treated sewage sludge is used, the recommended pre-harvest interval should be at least 10 months for all FFV eaten both raw and cooked. Relevant quality assurance specifications should be developed for anaerobic digestate and compost-based fertilisers purchased from external suppliers, including appropriate microbiological specifications for the final (fertiliser) product. A pasteurisation step should be included in the production of anaerobic digestates, where appropriate. In addition, where possible, standardised protocols should be developed and implemented to cover the production and use of quality assured anaerobic digestates and composts, including specification of appropriate source-segregated organic waste input material (feedstock). Growers should pay attention to potential for contamination of input materials and anaerobic digestates/composts with glass, metal or hard plastic especially when the material is applied to land used for growing potatoes and root FFVs. Growers buying livestock manure, sewage sludge and other organic fertilisers from the market should select a reputable supplier and obtain documentation that identifies the origin, treatment applied, and results of all tests (including for microbiological and chemical contaminants) carried out on the final product. Table 1 gives an example of pre-harvest intervals that should be followed when growers use organic fertilisers. Several factors linked to the use of water in agriculture may influence the risk of microbial contamination of the FFV, such as: source of water, type of irrigation (drip, sprinkler irrigation, etc. ), whether the edible portion of the FFV has direct contact with irrigation water, application of a water treatment by the grower, the timing of irrigation in relation to harvesting, possible access of animals to the source, etc. Another important issue to consider is the stage in the food chain: e.g. can a possible contamination still be eliminated or reduced by e.g. drying out (sun irradiation in the field), washing, etc. Ready-to-eat foods and foods closer to the point of consumption will require water of higher quality. 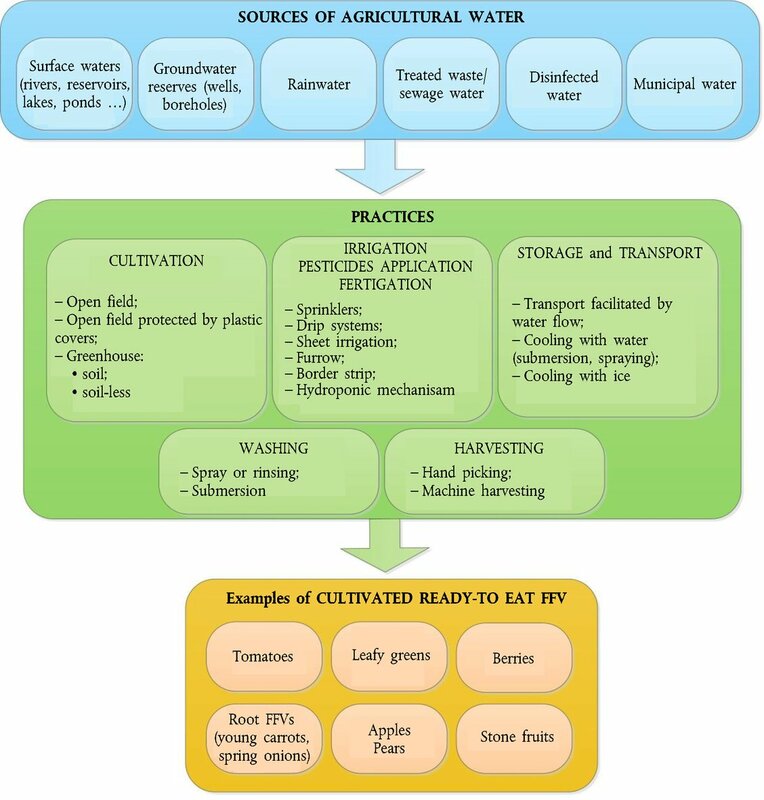 In agricultural practices different sources and quality of water are used for pre-harvest, harvest and post-harvest activities (all together called ‘agricultural water’ — see Flowchart No 2), with each of these having a different effect with regard to microbiological contamination of FFVs. Water of inadequate quality has the potential to be a direct source of contamination and a vehicle for spreading localised contamination in the field, facility, or during transport. Wherever water comes in contact with fresh produce, its quality impacts the potential for pathogen contamination. If pathogens survive on the produce, they may cause foodborne illness. Most associated pathogens related to transmission via water of low quality are enteric bacteria, e.g. Salmonella spp., Campylobacter spp., VTEC and viruses, e.g. Norovirus. E. coli is typically used as an index organism to faecal contamination and elevated levels of E. coli may indicate a higher potential for presence of pathogens. Guidelines developed by the World Health Organization (WHO) in 2006, for the safe use of wastewater and excreta in agriculture and aquaculture (47). (Annex I — Part A — II.3 (a)) ‘…FBO are to comply with appropriate Community and national legislative provisions relating to the control of hazards in primary production and associated operations, including measures to control contamination arising from air, soil, water, feed, fertilisers, veterinary medicinal products, plant protection products and biocides and the storage, handling and disposal of waste’. (Annex I — Part A — II.5 (c)) ‘FBO producing or harvesting plant products are to take adequate measures, as appropriate, to use potable water, or clean water, whenever necessary to prevent contamination’. A risk assessment should be carried out considering the source and the intended use of agricultural water (e.g. 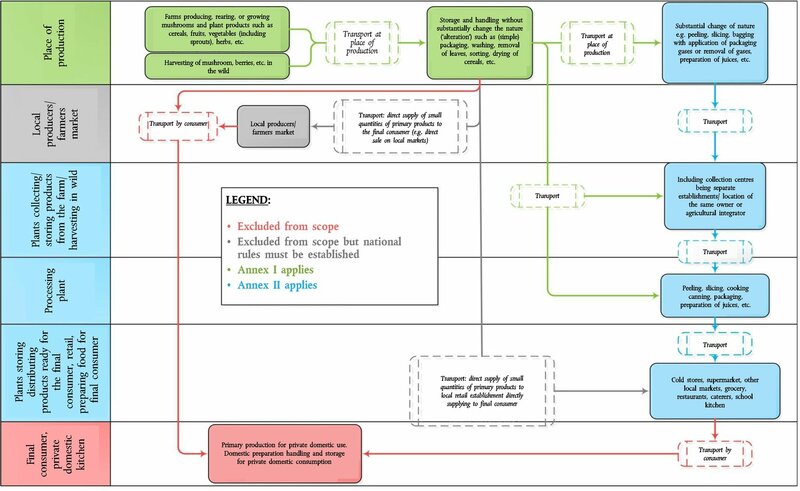 irrigation system, FFV characteristics, intended use of FFV…), defining the suitability for agricultural purposes, the recommended microbiological threshold values and the frequency of monitoring as described in Annex II of this guidance document. 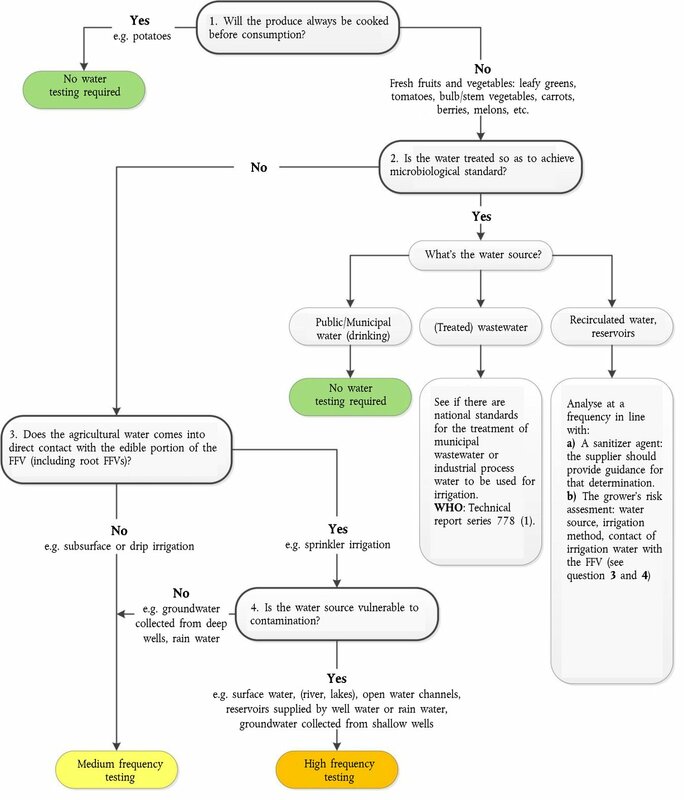 For guidance on performing a water risk assessment growers can refer to the approach illustrated in the flowchart No 3 which helps to identify the possible contamination sources of the water at primary production of FFV. This applies to both, irrigation water and water used for associated operations (e.g. pesticide application, fertigation, washing etc.). A more simplified and quick approach may be to use a ‘decision tree’ such as the one in Annex III of this guidance document, where the outcome takes into account a limited number of sampling recommendations compared to those contained in Annex II. Both tools may be used to take decisions based on the risk profile of agricultural water, but as the two approaches are different, the results cannot be comparable or extrapolated. Steps that any grower could use to identify possible contamination sources via water at primary production of FFV are summarised in the flowchart No 3 below. A practical way to carry out the risk assessment of agricultural water in flowchart No 3 is to complete the following table. In order to comply with the EU obligations (see Section 7.3.2), the results of this risk assessment will help by defining the extent to which GHP should be applied (7.3.3) including recommendations on the analyses of the water for agricultural use. Untreated (urban) sewage water should not be used. Before considering the use of any other waste water, competent authorities should be consulted as legal restrictions may apply. The quality of agricultural water possibly reused at farm level should be tested. If necessary, the water should be treated and/or disinfected before reuse. Livestock access to water sources and pumping areas should be avoided. Barriers should be constructed to prevent, as far as possible, wildlife access to waters used in the primary production of FFV. An assessment of the possibilities for contamination of the soil and water by surface water run-off at times of heavy rainfall is recommended, and that structures are built to retain this run-off (barriers formed of strips of vegetation, use of drainage channels, etc.). Water delivery systems including basins, tanks and storage of water sources should be maintained and cleaned appropriately, to prevent microbial contamination of water and biofilm formation. Locate latrines and store manure, faecal waste and fertilisers downhill and at least 250 meters away from water sources to prevent contamination. If needed, growers should assess local situations and foresee a longer distance. Verify that there is a proper separation between the well and the following: domestic waste systems, chemical storage facilities, animal buildings (such as kennel, barnyards, and feed lot facilities), toilets, septic or holding tank, liquid manure and organic fertiliser treatment and storage areas. Check the well casing or well cap on a regular basis to ensure there are no cracks or damage to the well casing or well cap, and the well cap fits tightly. The top of the well should be at least 30 cm above the ground to prevent surface water or contaminants from entering the well. Ensure that the area around the wellhead slopes away from the well and is free of leaves, grass and other debris. Build a concrete apron (1 meter radius) around the well or hand pumps. Disinfect the plumbing system (with Chlorine-based sanitizers or other disinfection treatments, for example). If mitigation strategies put in place are not sufficient to avoid contamination of the water source, reparation or construction of new wells should be considered. Protect open rainwater storage tanks with meshes to prevent contamination by debris, leaves, animals, and the breeding of insects (insects can be vectors for transmission of microbial contamination). Clean on a regular basis, or increase the frequency of cleaning, of open rainwater storage tanks, catchments and gutters of the harvesting systems to collect and maintain good quality rainwater. Change the storage tanks or gutters as necessary. Check the efficacy of water-treatment equipment that is in use. Disinfect the water treatment installations (e.g. by application of biocide or sanitizer) or change the cisterns and plumbing systems of locally collected water. If a grower wants to treats or to disinfect the water for producing potable water or to improve its quality, he has to fulfil the requirements of the Regulations on Biocides (49). For drip-irrigation, pools of water should be avoided on the soil surface or in furrows that may come into contact with the edible portion of the FFV (50). For overhead irrigation, a higher quality of water should be used as it comes into direct contact with the edible parts of the plant and if possible (51) only at the early stages of plant growth. A time interval between irrigation period and harvest can be applied. This is the case for all products eaten raw (leaf products, vegetables for salads, fruit, etc.) (See risk assessment of agricultural water in 7.3.3). The quality of the water use for soil-less systems should be regularly checked and should be changed frequently, or if recycled, it should be treated to minimize microbial contamination. If no compliance with indicators is observed, mitigation strategies mostly based on water treatment technique should be put in place. Flush the main, sub-main and other irrigation lines on a regular basis to reduce accumulation of organic materials or biofilms. It is recommended that the dripper line remains open for at least 1 minute, until the water runs clear. When there is a very intense and long rainy period, it is recommended to flush the system prior to the beginning of the next irrigation season. Many harvest and post-harvest operations include washing, rinsing, cooling, sorting and transport of the FFVs. The water used for these associated operations is hereafter called ‘wash water’. In general, washing (by immersion or spraying) fresh produce may partly reduce the microbial load. This is an important step since most microbial contamination is on the surface of FFV. However, wash water can also redistribute the microorganisms and potentially contaminate a greater proportion of the produce. The wash water used should be at least of clean water quality for initial washing stages. Water used for final rinses has to be of potable quality if the FFV is often consumed as ready-to-eat (e.g. tomatoes, apples, pears, young carrots, spring onions …). Therefore, a risk assessment should be conducted according to flowchart No 2 and the tools foreseen in Annex II or Annex III can be applied for evaluation of the required quality of the wash water. Use of the lowest possible concentrations of chlorine disinfectants that allow achieving the desired disinfection level. A sufficient refreshment rate of the washing water. While the active chlorine evaporates, the chlorate residues concentrate in this water. A proper storage of the disinfectants as storage exposed to light or at a high temperature already causes the degradation of chlorine disinfectants to chlorate prior to their usage. Vigorous washing of produce not subject to brushing may increase the likelihood of pathogen removal. Brush washing is more effective than washing without brushes. Brushes used in brush washing should be cleaned frequently. Controlled use of water disinfectant agents to avoid cross-contamination. For some operations, a series of washes may be more effective than a single wash to remove soil, debris and exudates. For example, considering using an initial wash treatment to remove the bulk of field soil from produce followed by additional washes and a final potable water rinse. Installation, routine inspection and maintenance of equipment such as backflow devices and air gaps are needed, to prevent contamination of clean water with potentially contaminated water (such as between potable water fill lines and dump tank drain lines). As fresh leafy vegetables may be sprayed with small amounts of water during machine harvest or in the field container just after harvest to hydrate FFVs, potable water has to be used in processes in which there is direct contact between the water and edible portions of the leafy vegetables. Tomatoes from soil-based systems may be washed to remove dust, surface dried, sized and packed. In this case, also potable water should be used. Water temperatures should be higher than the internal temperatures of melons and watermelons, so as to minimize the risk of water infiltration. The time when melons/watermelons remain in dump tank water should be minimized. Where possible the microbiological quality of dump tank water should be controlled, monitored and recorded. If needed, control measures should be applied to guarantee the microbiological quality of the water. Before commencing a water sampling strategy, it is recommended to check whether the risk assessment is still valid and the preventive measures are correctly implemented and validated. Risk assessments (see 7.3.2) should be reviewed annually. Microbial analyses (53) of the potential water sources should be performed to determine the suitability of the water source for its use as agricultural water. Visual and smell inspections should be carried out periodically with the aim of detecting possible contamination. In case of change of visual/smell characteristics, samples should be collected for control analysis. Samples of water should be taken at the point of use. The frequency of testing (54) of agricultural water may be reduced, provided that the results of the recommended analyses are favourable for three consecutive years and taking into account whether or not the water is vulnerable to contamination, e.g. ground water. Additional samples should be taken in case of events such as flooding, overflow of places where manure is stored, temporary or intermittent contamination, heavy rain, etc. These additional tests should be done just after the occurrence of the event. Stop using the water until analysis results are favourable and if it is possible and feasible, change the source. Alternatively treat the water before irrigation (e.g. water disinfection by ultraviolet light, reverse osmosis filtration, ozone or chlorine based disinfectants, etc.…) depending on the disinfection practices in place in the Member State. The frequency of water sampling and scope of microbial testing might be adjusted to specific situations: additional sampling should be carried out to verify presence of Salmonella spp., and pathogenic E. coli (i.e. VTEC). Review the current risk assessment (see 7.3.1) by focusing on potential sources of faecal contamination. After implementing corrective actions, if water test is still unfavourable, and if the grower is not able to change the water source, the grower should increase the time interval between the last irrigation period and harvest and change the irrigation method to prevent water coming into contact with the edible portion of the FFV, such as drip or trickle tape. All workers should be aware of the basic principles of hygiene and health, and should be informed about all the possible risks related to the contamination of the product. They should receive hygiene training appropriate to their tasks and be periodically assessed. Such training should be delivered in a language and manner to ensure understanding of the required hygienic practices. In general unauthorised visitors should be excluded from food production and handling areas. The visitors should complete a health screening questionnaire prior to admission and, where appropriate, wear protective clothing and adhere to the staff hygiene provisions of the food business. Whenever possible, harvesting, packing and inspection processes should be designed to reduce handling. Each grower should put in place illustrated and easy to read documentation (55) related to health status, good hygiene practices, staff training and sanitary facilities, to ensure staff, contractors and visitors are aware of, and follow GHP at all times. Personal effects such as jewellery, watches etc., should not be worn or brought into FFV cropping or production areas. When standard practices require the use of utensils or small objects, they should be duly numbered or identified. If the gloves are reusable, they should be made of materials that are easily cleaned and disinfected, and they should be cleaned regularly and stored in a dry clean area. If disposable gloves are used, they should be discarded when they become torn or soiled. Workers who have direct contact with FFV should maintain a high degree of personal cleanliness. In general, they should properly wash and dry their hands before handling FFV (e.g. at the beginning of the harvest, during harvesting and post-harvest handling, after having eaten, after having used the toilet, etc.) or touching food contact surfaces, particularly during harvesting and postharvest handling. Workers should refrain from behaviour which could result in the contamination of FFV, for example: smoking, spitting, chewing gum or eating, or sneezing or coughing over fresh produce. Any sick person should immediately report illness or symptoms of illness to the grower/line manager and must not work in contact with FFV. Be located in close proximity (56) to the fields and indoor premises in a manner to encourage their use and reduce the likelihood that workers will relieve themselves in the field, and in sufficient number to accommodate personnel (e.g. 1 per 20 people) and be appropriate for both genders if the workforce contains males and females (57). Be of appropriate design to ensure hygienic removal of wastes and avoid contamination of growing sites, FFV or agricultural inputs (e.g. agricultural water, organic fertilisers). Have adequate facilities for hygienic (hand) washing. Be maintained under sanitary conditions and good repair. Include potable running water, soap, toilet paper or equivalent, and single use paper towels or equivalent. If potable running water is not available, an alternative hand washing method should be recommended by the relevant competent authority (i.e. use of soap or disinfectant). Portable toilets should not be cleaned in FFV cropping areas or near irrigation water sources or conveyance systems. Growers should identify the areas where it is safe to put portable toilets. Training should include proper hand washing and drying procedures, toilet use and proper disposal of toilet paper or equivalent. Hand cuts and wounds should be covered by a suitable waterproof dressing and gloves worn to cover bandages where practical. If these supplies are not available, the affected person should be reassigned to another working area where they do not handle FFV or touch food contact surfaces. Areas away from the field and packing lines should be provided for workers to take breaks and eat. Workers should not take any food with them into production areas to avoid possible contamination of FFV with food allergens. Harvesting methods vary depending upon the characteristics of the product. Mechanical harvesting is a common practice for some FFV and reduces the cross-contamination events that might occur during manual harvest. But if such equipment breaks down during the harvest, or it has been poorly maintained, inadequately cleaned/disinfected, or if it damages the harvested plant, it can cause spread of microbial contamination and/or conditions that support microbial growth (i.e. damaged FFV). FFV should be stored and transported under good hygienic conditions. Storage facilities and vehicles for transporting the harvested FFVs should be constructed in a manner that will minimise damage to FFV and prevent access by pests such as insects, rodents and birds. Design and lay-out of facilities should be such as to ensure there is no risk of microbiological, chemical or physical cross-contamination. The level of risk of cross-contamination in relation to product flow within facilities should be considered and addressed at all steps (i.e. arrival of the raw-material, prewash trimming and packaging through to storage and shipping. Care should be taken when packing fresh produce in the field to avoid contaminating containers by exposure to manure, animal faeces, soil or water. When padding is used with post-harvest handling equipment to prevent damage, it should be constructed of material that can be cleaned and if possible disinfected. Growers should remove excessive dirt and caked mud from produce and/or containers during harvest and should clean all their tools/utensils and containers used repeatedly during harvest after each load. Growers should avoid setting harvesting containers or harvested fresh produce directly on soil during/after harvest and before loading into transport vehicle. They should avoid using harvesting containers that come into direct contact with fresh produce for purposes other than holding produce. Packaged products intended for direct consumption should be correctly labelled and stored. Where necessary, suitable temperature and relative humidity conditions should be fixed for storage. Growers should avoid over-filling totes and bins to prevent the potential transfer of contaminants to fresh produce during stacking. It would also prevent damage to the produce. Clean cuts should be made to harvested fruit and vegetables, without tearing the stem or stalk. FFV unfit for human consumption should be left un-harvested or segregated during harvesting. Culls should be hygienically removed from the packing facility by a worker who is not handling healthy fruit or vegetables and disposed of to avoid attracting pests. Plastic should be clean and sanitary. Biodegradable materials and/or mulch should not be reused in order to prevent cross contamination. Good hygienic practices should be maintained along the food chain, as berries are mainly consumed raw and/or subjected to minimal processing such as cleaning, washing or cooling. Berries should be cooled immediately after harvesting. When required, growers should use potable water for ice and hydro coolers when precooling to minimise risks of contamination. Appearance and firmness of berries are commonly associated with fruit quality and freshness. Over-handling the berries may damage them and affect fruit quality. Moreover, adverse temperatures during harvesting in hot and/or humid weather also decreases quality and may affect food safety due to fruit damage and juice leakage, which may spread contamination over healthy fruits. Growers are encouraged to designate a responsible person to supervise harvesting at all times to ensure harvesters use proper hand washing procedures and to avoid harvesting wet, bruised and/or damaged fruits. Before setting cups underneath melons/watermelons, ensure that they are clean, sanitary, without sharp edges and do not result in water collection under the fruit surface. When turning melons/watermelons on the cups and during harvesting operations ensure that workers follow good hygienic practices. Use biodegradable materials only once to prevent cross-contamination. Products should be loaded in such a way that they do not suffer any damage during transport. All efforts should be made to protect the harvested products from the sun, the wind, the rain, pests and other animals. The harvested products should be taken to the handling and packing area as quickly as possible. Where the temperature is high, the transfer should be accelerated. The product may be placed in field boxes or other containers suitable for food use, without throwing or pressing. Boxes should not be filled above their top edges. Storage areas are clean and suitable for each type of product stored. Harvested products must not be stored together with potential sources of contamination, e.g. animals, chemical products etc. The vehicles for transport should be clean: FFV should not be transported together with potential sources of contamination, e.g. animals, chemical products. If the vehicle has been previously used to transport animals, plant protection products, biocides, engine lubricant, fuel or any waste material, the vehicles should be suitably cleaned, and if necessary disinfected, before being used to transport FFV. In all cases vehicles used to transport FFV should be periodically cleaned. FFV unfit for human consumption should be separated before storage or transport. Those which cannot be made safe by further processing should be disposed of hygienically. The field boxes or other containers used for the transport of FFV should be cleaned periodically and should not have any cracks or protrusions that could damage the product. Cleaning procedures should include the removal of debris from equipment surfaces, application of a detergent solution, rinsing with water, and, where appropriate, disinfection. The effectiveness of cleaning and disinfection of food contact surfaces should be periodically verified by swabbing. Where appropriate, an adequate supply of clean water with appropriate facilities for its storage and distribution should be available in indoor primary production facilities. Clean water should be used to clean all equipment directly contacting FFV, including farm machinery, harvesting and transportation equipment, containers and knives. Non-potable water should have a separate system. Non potable water systems should be clearly identified and should not connect with, or allow reflux into, potable water systems. Adequate drainage and waste disposal systems and facilities should be provided. Growers should properly store their equipment, and cut weeds or grass within the immediate vicinity of the buildings. Growers should avoid moving harvesting equipment across fields where manure or compost was applied. Growers are recommended to clean and disinfect harvesting equipment seasonally or as needed. A schedule for the cleaning and disinfection of these facilities, as well as the equipment and utensils used for packaging is recommended. Cleaning and disinfection programmes should not be carried out in a location where the rinse might contaminate FFV. A grower can use biocides to disinfect the food contact surfaces, equipment used for washing, rinsing and cooling of FFV. Cleaning materials (e.g. detergents, biocides, etc.) should be clearly identifiable and kept separately in secure and good storage facilities (58). They should be properly authorized and used for their intended purpose according to the manufacturer’s instructions. 7.5.4.3. Additional good practice recommendations in relation to storage and packing facilities for growers of tomatoes, berries, melons/watermelons and leafy greens. In general, but especially for tomatoes, melons and watermelons, those that have undergone cleaning and/or chemical treatment should be effectively separated, i.e. in separate premises or treated at separate times, from raw material and environmental contaminants. In addition, packing premises and rooms should be designed to separate areas for incoming tomatoes from the field (areas for incoming soiled tomatoes) from those used for subsequent handling. Where feasible, raw material handling areas should be separated from packing areas. During cooling and washing of leafy greens, maintenance of the microbial quality either by sufficient water renewal or by water treatment should be ensured to reduce the build-up of microorganisms and reduce risks of cross-contamination of produce. An effective traceability system (back and forward) should be documented to indicate the source of a product and a mechanism for marking or identifying the product that can trace the product from the farm. The grower may be assisted by other persons, such as farm technicians, with the keeping of records. This information should be made available to the competent authorities on request, as well as the food business operators taking delivery of the harvested products. (Annex I — Part A — III. 7): Food business growers are to keep and retain records relating to measures put in place to control hazards in an appropriate manner and for an appropriate period, commensurate with the nature and size of the food business. Food business growers are to make relevant information contained in these records available to the competent authority and receiving food business growers on request. The results of any relevant analyses carried out on samples taken from FFVs or other samples that have importance to human health. Personnel — training to show personnel are aware of hazards, return to work after illness procedures. (Article 18(2)) ‘Food business operators shall be able to identify any person from whom they have been supplied with a food or any substance intended to be, or expected to be, incorporated into a food (…). To this end, such operators shall have in place systems and procedures which allow for this information to be made available to the competent authorities on demand’. (Article 18(4)) ‘Food which is placed on the market or is likely to be placed on the market in the Community shall be adequately labelled or identified to facilitate its traceability, through relevant documentation or information in accordance with the relevant requirements of more specific provisions’. (Article 19(1)) ‘If a food business operator considers or has reason to believe that a food which it has imported, produced, processed, manufactured or distributed is not in compliance with the food safety requirements, it shall immediately initiate procedures to withdraw the food in question from the market where the food has left the immediate control of that initial food business operator and inform the competent authorities thereof. Where the product may have reached the consumer, the operator shall effectively and accurately inform the consumers of the reason for its withdrawal, and if necessary, recall from consumers products already supplied to them when other measures are not sufficient to achieve a high level of health protection’. A food recall/withdrawal plan consists of a set of documents/support materials designed to facilitate the removal of food from the market and to provide the correct information to businesses, consumers and the competent authorities. The grower should ensure that the recalled food is not placed on the market through other channels. In the event of a foodborne illness outbreak associated with FFV, maintaining appropriate records of production and associated operations such as packaging and transport may help identify the source of contamination in the food chain and facilitate product recalls. (3) As follow up of this EFSA Opinion, 4 specific regulations have been adopted: Commission Regulations (EU) No 208/2013, (EU) No 209/2013, (EU) No 210/2013 and (EU) No 211/2013 of 11 March 2013 on traceability requirements, on approval, on microbiological criteria, and on certification requirements for imports into the Union of sprouts and seeds intended for the production of sprouts. (4) For example, modified atmosphere packaging, or peeling or shredding to smaller pieces used for fresh minimally processed fruits and vegetables are not within scope of Annex I. (5) Mycotoxins are excluded from the scope of this guide, as it is based on EFSA opinions related to microbiological pathogens. (6) Leafy greens eaten raw as salads, berries, tomatoes, melons and bulbs/stem vegetables and carrots. (7) See definition of sprouts in Article 2 of Commission Implementing Regulation (EU) No 208/2013 on traceability requirements for sprouts and seeds intended for the production of sprouts. Sprouted seeds fall under the scope of Annex I of Reg. 852/2004 (Primary production) (OJ L 139, 30.4.2004, p. 1). (9) OJ L 139, 30.4.2004, p. 1. (10) OJ L 338, 22.12.2005, p. 1. (11) OJ L 70, 16.3.2005, p. 1. (12) OJ L 181, 4.7.1986, p. 6. (14) OJ L 375, 31.12.1991, p. 1. (15) OJ L 300, 14.11.2009, p. 1. (16) OJ L 54, 26.2.2011, p. 1. (19) NB: If inorganic fertilisers are used, no need to answer the other questions of this check list as they are not described in this guide. (20) Regulation (EC) No 1069/2009 of the European Parliament and of the Council of 21 October 2009 laying down health rules as regards animal by-products and derived products not intended for human consumption and repealing Regulation (EC) No 1774/2002 (OJ L 300, 14.11.2009, p. 1). (21) Council Directive 86/278/EEC of 12 June 1986 on the protection of the environment, and in particular of the soil, when sewage sludge is used in agriculture (OJ L 181, 4.7.1986, p. 6). (22) As described in Chapter 7.4 (paragraph 7.4.3). (23) As described in paragraph 7.5.4.2. (24) Regulation (EC) No 1107/2009 of the European Parliament and of the Council of 21 October 2009 concerning the placing of plant protection products on the market and repealing Council Directives 79/117/EEC and 91/414/EEC (OJ L 309, 24.11.2009, p. 1). (25) In line within the requirements of Integrated Pest Management. (26) Only edible part is considered here. (27) Although this guide deals with organic fertilisers only, the risks associated with using water soluble inorganic fertilisers are covered in the section on water (Chapter 7.3 of the guide). (28) Commission Regulation (EU) No 142/2011 of 25 February 2011 implementing Regulation (EC) No 1069/2009 of the European Parliament and of the Council laying down health rules as regards animal by-products and derived products not intended for human consumption and implementing Council Directive 97/78/EC as regards certain samples and items exempt from veterinary checks at the border under that Directive lays down requirements for transformation of animal by-products in the production of organic fertilisers and soil improvers, including some microbiological standards for digestion residues and compost. Manure produced and used on the same farm may be applied to land without processing if the competent authority does not consider it to be a risk for the transmission of any serious transmissible disease (OJ L 54, 26.2.2011, p. 1). (29) I.e. a plan for spreading livestock manure, slurries and organic wastes on the farm. Any plan will help the grower to minimise the risk of causing water pollution. This plan should help to meet national legislative requirements transposing Council Directive 91/676/EEC. (30) To protect water against pollution caused by nitrates, the spreading time of treated manures must be done respecting the requirements established by Council Directive 91/676/EEC. (31) According to ‘EFSA’s scientific opinion on the risk from Salmonella and Norovirus in leafy greens eaten raw as salads reports’. (32) Conventional treated sewage sludge includes lagoon stored, thickened and mesophilic anaerobic digested sludge. Treatment must ensure 99 % of pathogens have been destroyed (a 2 log reduction). (33) Enhanced treated sewage sludge includes pasteurisation, thermophilic digestion, lime stabilisation and composting. Treatment must ensure 99,9999 % of pathogens have been destroyed (a 6 log reduction). (34) Commission Regulation (EU) No 142/2011 lays down some microbiological standards for digestion residues and compost derived from processing of Animal By-Products, including manure. (*1) These pre-harvest intervals are examples of good practice and growers should interpret this guidance according to the risks associated with their particular operation. Factors that affect the rate at which pathogens in fresh manures/slurry die off after application to land include temperature, UV radiation, pH, drying, soil type etc. Other time periods may therefore be justified based on regional differences in climate and environmental conditions etc. (1) Where livestock grazing is an essential part of the farming system (e.g. in some organic farms) there should be a minimum 6 months gap between livestock grazing and harvest. To minimise risks further, the guidance in the table above should be followed where practically possible. (35) For example BSi PAS 110 or equivalent. (36) For example BSi PAS 100 or equivalent. (37) Farm manures and slurry should be stored as a batch for a minimum of six months with no additions of fresh manure or slurry during this time. More active forms of treatment include composting (solid manures) and lime treatment (slurry) (see Section 7.2.3.2). (38) Conventional treated sewage sludge includes lagoon stored, thickened and mesophilic anaerobic digested sludge. Treatment must ensure 99 % of pathogens have been destroyed (a 2 log reduction). (39) Enhanced treated sewage sludge includes pasteurisation, thermophilic digestion, lime stabilisation and composting. Treatment must ensure 99,9999 % of pathogens have been destroyed (a 6 log reduction). (40) May have history of pathogen contamination, e.g. whole head lettuce, leafy salads, celery, salad onions, radish, fresh and frozen herbs, etc. (41) Target of zero and absolute limit of < 0,1 % (m/m dry weight) glass must be achieved (i.e. limit for glass debris/contamination of the compost or treated manure). (42) May have history of pathogen contamination, e.g. apple, beetroot, blackcurrant, blueberry, broad bean, broccoli, cabbage, capsicum, carrot, cauliflower, celeriac, cherry, courgette, cucumber, garlic, green beans (other than runner beans), melon, mushroom, onion (red and white), pea, pear, peach, plum, raspberry, strawberry, sugar snap peas, sweet corn, tomato and tree nuts, etc. (43) Target of zero and absolute limit of < 0,1 % (m/m dry weight) glass must be achieved (i.e. limit for glass debris/contamination of the compost or treated manure). (44) For example artichoke, leek, marrow, parsnip, potato, pumpkin, runner bean, squash, swede, turnip, etc. (45) ISO 16075-2:2015 Guidelines for treated wastewater use for irrigation projects. (48) When multiple sources or a mixture of water of different sources are applied, conduct the risk assessment for each source used. (49) (The definition of processing aids in FFV is harmonised within the EU (Regulation (EC) No 1333/2008), and disinfecting agents have to be approved according to the Regulation (EU) No 528/2012 of the European Parliament and of the Council of 22 May 2012 (OJ L 167, 27.6.2012, p. 1) concerning the making available on the market and use of biocidal products. Substances used as processing aids shall be used under conditions of good manufacturing practices (GMP). Some companies use chlorine or other agents to control microbial load in the water. Chlorine in the form of sodium hypochlorite granules, tablets or liquid is the most commonly used as disinfection agent. The quantities of chlorine used should be compatible with the EU maximum level of chlorates that could be found in the final product (see also point 7.3.4.3(d)). In addition, Chlorate is a substance that is no longer approved as a pesticide according to Commission Decision No 2008/865/EC. Since no specific MRL was fixed under Regulation (EC) No 396/2005 on maximum residue levels for pesticides, the default MRL of 0,01 mg/kg is applicable to all food products included in Annex I to that Regulation. The MRLs of Regulation (EC) No 396/2005 are applicable to residues of substances that are currently used or have been formerly used as pesticides. The MRL of 0,01 mg/kg is therefore applicable to chlorate even though most of the current residues arise from uses of chlorine disinfectants as biocides). (50) It is the same for pesticides application. (51) If the quality of water is not very high, this method of irrigation should only be used during the early stages of growth. (52) Categories of fruits and Vegetables evaluated by EFSA Opinions as the most risky categories: produce contaminated by Salmonella/Noroviruses. (53) Water samples should be sent to a laboratory for microbial analyses. (54) If it is decided to include the proposed microbiological testing frequencies, see the frequencies set up in Annex II, pages 35 to 37. (55) Documentation means posters on walls, or leaflets left in visible places, where they can be seen by anyone who enters the establishment. (56) E.g. max. 400 m or 5 minutes walking distance. (57) E.g. if there are less than 25 workers, one mixed toilet is allowed. If there are more than 25 workers, there should be one toilet for every 20 workers, and separated by gender. (58) For example hypochlorites which are not correctly stored may be transformed into an accumulation of chlorates. Agricultural inputs: any incoming material (e.g. seeds, fertilisers, water, agricultural chemicals, plant support, etc.) used for the primary production of fresh fruits and vegetables. Agricultural water: is water used in primary production activities (pre-harvest, harvest and post-harvest) on produce where it is intended to, or is likely to, contact either the produce itself or surfaces that come into contact with the produce. It includes but is not limited to irrigation water and washing water during and after harvest, application of fertiliser, or agricultural chemicals, during cooling of produce, cleaning of equipment etc. Berries: despite the wide variety of plant species grown for berry production, the most important types for the fresh market in the EU are strawberries, raspberries, blackberries and blueberries. Berries can be produced by small herbaceous plants (e.g. strawberry), bushes (e.g. blackberry, blackcurrant, blueberry, gooseberry, raspberry) or small trees (e.g. mulberry, elderberry). Berries are a perishable food which can be consumed as fresh as well as a frozen ingredient added to many foods. Biocides (Regulation (EU) No 528/2012): Chemicals used to suppress organisms that are harmful to human or animal health, or that cause damage to natural or manufactured materials. These harmful organisms include pests and germs (i.e. moulds and bacteria). Examples of biocidal products are disinfectants, agricultural chemicals. Clean water : ‘water that does not compromise food safety in the circumstances of its use’. It is clean seawater (natural, artificial or purified seawater or brackish water that does not contain micro-organisms, harmful substances or toxic marine plankton in quantities capable of directly or indirectly affecting the health quality of food) and fresh water of a similar quality. Conventional treated sludge: Conventional treated sewage sludge includes lagoon stored, thickened and mesophilic anaerobic digested sludge. Treatment must ensure 99 % of pathogens have been destroyed (a 2 log reduction). Cropping area: area of ground used for cultivating FFV (while growing or when harvested/gathered). Cultivation: any agricultural action or practice used by growers to allow and improve the growing conditions of fresh fruits or vegetables grown in the field (with or without cover) or in protected facilities (soil-less systems). Decontamination treatments: Mechanical, physical and chemical treatments which are applied to eliminate or reduce contaminants, including microbial contamination. They can be applied to water, food contact surfaces (such as equipment and production areas). Sometimes also called disinfection treatments. Disinfectants: Agents or systems that kill or eliminate bacteria found on inanimate surfaces or environments. Disinfectants are classified as low, medium or high-level disinfectants, depending on how many types of microorganisms they kill. Within this guide, disinfectant agents or systems are defined as those agents applied to eliminate microorganisms in agricultural water, including water used in postharvest steps such as washing and rinsing. Disinfectants are biocides. Disinfection: Process that destroys, inactivates, or removes microorganisms. Disinfected water: Water which has been treated to remove microorganisms. Different disinfectants treatments can be applied. The water can come from multiple sources such as rainfall water, treated waste water, ground water, etc. The water is treated to obtain a certain microbiological quality, as and when it is needed. Enhanced treated sludge: Enhanced treated sewage sludge includes pasteurisation, thermophilic digestion, lime stabilisation and composting. Treatment must ensure 99,9999 % of pathogens have been destroyed (a 6 log reduction). Fertigation: Injection of fertilisers, soil amendments, and other water-soluble products into an irrigation system. Flooding: flowing or overflowing of a field with water outside a grower’s control. Pooled water (e.g. after rainfall) that is not reasonably likely to cause contamination of the edible portions of fresh produce is not considered flooding. Fresh Produce refers to fresh fruits and vegetables that are likely to be sold to consumers in an unprocessed (i.e. raw) form and are generally considered as perishable. Fresh produce may be intact, such as strawberries, whole carrots, radishes, and fresh marketed tomatoes, or cut during harvesting from the root/stem, such as celery, broccoli, and cauliflower. Good Agricultural Practices (GAP) apply available knowledge to address environmental, economic and social sustainability for on-farm production and post-production processes resulting in safe and healthy food and non-food agricultural products (FAO, 2003 (1)). This guidance is based on GAP and GHP. Good Hygiene Practices (GHP) relate to general, basic conditions for hygienic production of a foodstuff, including requirements for hygienic design, construction and operation of the plant, hygienic construction and use of equipment, scheduled maintenance and cleaning, and personnel training and hygiene. A developed and implemented GHP programme is a pre-requisite for Hazard Analysis and Critical Control Point (HACCP) system. Greenhouses: indoor site, generally enclosed by glass or plastic, in which plants are grown. Groundwater: also recalled as bore hole water, well water, is water pumped from the ground, in deeper or more superficial layers. Harvest is the process of collecting commercial stage of FFVs from the fields and immediate handling. Leafy greens: leaves, stems and shoots from various leafy plants which are eaten as vegetables, and only those eaten raw. The major FFV types of leafy greens are: ‘lettuce’ types, leafy brassicas, cabbage, chicory and watercress. ‘Lettuce’-type leafy greens can be harvested at different development states, e.g. as mature whole heads, as baby leaves or as multi-leaves. Manure (Regulation (EC) No 1069/2009): means any excrement and/or urine of farmed animals other than farmed fish, with or without litter. Municipal water: water provided to the grower by municipal or governmental organisations. It is potable water which is provided. Non potable water: water which does not meet the requirements laid down in Council Directive 98/83/EC of 3 November 1998 on the quality of water intended for human consumption. Packing establishment/Packaging establishment or Pack house/Packing house: any establishment in which fresh fruits and vegetables receive postharvest treatment and are packaged. Plant protection products are ‘pesticides’ that protect FFVs or desirable or useful plants. The most common use of pesticides is in the form of PPPs. They are primarily used in the agricultural sector but also in forestry, horticulture, amenity areas and in home gardens. The term ‘pesticide’ is often used interchangeably with ‘plant protection product’; however, pesticide is a broader term that also covers non plant/FFV uses, for example biocides. Post-harvest is the stage of FFV production after harvest and includes cooling, cleaning, sorting and packing. Potable water is water which meets the requirements laid down in Council Directive 98/83/EC. Pre-harvest incorporates all activities on the farm that occur before FFV products are harvested. The term ‘primary production’ in this guidance document should be understood as primary production including these associated operations. The harvesting of wild mushrooms, seaweed and berries and their transport to an establishment. Processing are any actions that substantially alter the initial product, including peeling, shredding, cutting, freezing, blanching or a combination of those processes. Processing aids : As laid down in Article 3.2(b) of Regulation (EC) No 1333/2008 on food additives (2) it is any substance which is not consumed as a food ingredient by itself, which is intentionally used in the processing of raw materials, foods or their ingredients, to fulfil a certain technological purpose during treatment or processing and which may result in the unintentional but technically unavoidable presence of residues of the substance or its derivatives in the final product, provided that they do not present any health risk and do not have any technological effect on the finished product. Production area: premises where harvested crops are handled, processed and packaged. Rainfall water: water collected from rainfall (or snow). Sometimes also called rain harvested water. Ready-to-eat food: food intended by the producer or the manufacturer for direct human consumption without the need for cooking or other processing which acts to eliminate or reduce to an acceptable level micro-organisms of concern (according to Commission Regulation (EC) No 2073/2005). In this guide, it specifically relates to ready-to-eat FFV which includes all FFV that can be eaten raw (some examples are provided in Flowchart 2, i.e. apples, pears, plums, leafy greens, tomatoes, berries etc.). Soil-less systems: a general term for the production of plants without soil in a water medium or on substrate. Surface water: water from creeks, lakes, rivers, canals, etc. not fully under control by the growers (e.g. upstream contamination is possible). Sewage sludge (Council Directive 86/278/EEC): sludge from domestic or urban waste treatment plants, septic tanks and similar sewage treatment plants. Treated sludge (Council Directive 86/278/EEC): sludge that has undergone biological, chemical or heat treatment, long-term storage or any other appropriate process to make it significantly less likely to ferment (reducing its risk to health). Treated wastewater: is obtained by a combination of physical (mechanical) unit operations and chemical and biological processes for the purpose of reducing the organic and inorganic contaminants in the wastewater (according to ISO 16075-2:2015. This type of water has undergone primary and secondary treatment or can also have undergone decontamination treatments. Waste water is water collected principally by municipalities that can include spent or used water from domestic institutional, commercial, or industrial sources (according to ISO 16075-2:2015). Water reuse is the use of treated wastewater for beneficial use (according to ISO 16075-2:2015). (2) Regulation (EC) No 1333/2008 of the European Parliament and of the Council of 16 December 2008 on food additives (OJ L 354, 31.12.2008, p. 16). This matrix provides growers with a tool to perform a risk assessment of water used in primary agricultural production due to the combination of water source, irrigation method or potential contact with FFVs and commodity type (ready-to-eat or not). It sets frequencies (high, medium and low) for analysis of the water for indicators of faecal contamination (indicator E. coli) during the use of the water (growing season or period of application of the water source) and corresponding thresholds, depending on the intended use of the water, the water source, the characteristic and the nature of the FFV. High frequency would correspond to one analysis per month; medium frequency one analysis twice a year and low frequency once per year. But in any case, the scheme and recommended measures are just examples, which may be modified, based on the risk assessment of each farm. A year can be defined as a calendar year in case of year-round production (e.g. greenhouses) or can be the growth season. This matrix suggests that the grower should take a number of samples, larger on higher risk FFVs that are eaten uncooked by the consumer and actions to reduce the risk of contamination of FFV are proposed. In case of irrigation, the samples should be taken during peak-use period for irrigation and if there are crops in summer, at least, one of the samples should be taken in this season. 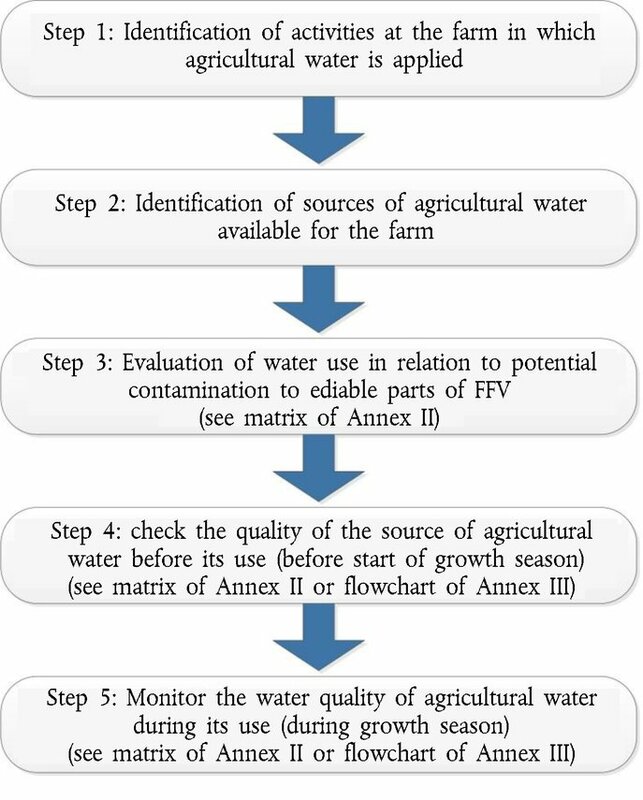 If the test result of the water source is unfavourable or identifies a potential problem, the grower should take some corrective actions set out in points 7.3.4.1 and 7.3.4.2, to reduce the risk to the consumer and after that, another water test should be carried out, to verify the effectiveness of the actions taken. x Dark Grey: should not be used. If the grower has no alternative but to use it, he should carry out high frequency testing or consider water treatment/disinfection, taking E. coli thresholds in column 8, as a meaningful indicator for an acceptable quality water to use in that activity. Medium-Dark Grey: can be used, but subject to sampling. The grower should carry out testing with medium frequency, taking E. coli thresholds in column 8, as a meaningful indicator for an acceptable quality water to use in that activity. Light Grey: can be used, but subject to sampling. The grower should carry out testing with low frequency, taking E. coli thresholds in column 8, as a meaningful indicator for an acceptable quality water to use in that activity. √ White: can be used without any sampling or analysis, or with only analysis required, to monitor the disinfection of water. Dilution or application of pesticide, fertiliser or agrochemicals and cleaning equipment for ready-to-eat FFV and direct contact. Irrigation of FFVs likely to be eaten cooked (irrigation water comes into direct contact with the edible portion of the FFV). Dilution or application of pesticide, fertiliser or agrochemicals and cleaning equipment used in this FFV direct contact). Irrigation of FFVs likely to be eaten cooked (irrigation water does not come into direct contact with the edible portion of the FFV). Post-harvest cooling and post-harvest transport for non-ready-to-eat FFVs. Water used for first washing of products in case of ready-to-eat products. Cleaning equipment and surfaces where the products are handled. Water used for washing of products likely to be eaten cooked (potatoes…) — non ready-to-eat FFVs. (1) Water applied by irrigation within two weeks prior to harvest of FFVs that may be eaten uncooked (ready-to-eat) should be free of contamination, i.e. of potable quality wherever possible. (2) These recommended thresholds relate to maximum concentration in samples. (3) Surface water and Ground water from wells (e.g. boreholes) might be of good microbiological quality and meet the 100 CFU/100 ml thresholds without treatment. (4) Surface water and Ground water from wells (e.g. boreholes) might be of good microbiological quality and meet the 100 CFU/100 ml thresholds without treatment. (5) For the purpose of this matrix, treated sewage water means wastewater that has been treated so that its quality is fit for the intended use and complies with the standards established by the national legislation of the MS or, in the absence of such national legislation, with WHO guidelines on the safe use of wastewater and excreta in agriculture. (6) Disinfection treatment should be well controlled and monitored. The applied disinfection treatment is under the control of the grower or producer. (7) Since the irrigation water does not come into contact with the edible part of the FFV a value higher than 1 000 CFU/100 ml should be applied for E.coli. Irrigation methods such as drip or sub-surface will present a lower risk of contaminating the edible part of a lettuce FFV than overhead irrigation. (8) Multiple sources of water can be used but it must be potable water quality which needs to be delivered. So, in practice it will be municipal water or disinfected water which can be used here. This approach is simplified compared to the one described in Annex II, as the outcome takes into account a limited number of sampling recommendations. It is worth pointing out that results obtained from this decision tree (Annex III) and from the matrix (Annex II) cannot be comparable.